St. Croix Foundation for Community Development will mark 28 years of service to the US Virgin Islands community on September 24, 2018. Established in 1990, the Foundation has served as a conduit for over $40,000,000 in funding for community-based projects throughout the Virgin Islands. With an incomparable track record of successful community development initiatives and national recognition for its work in education reform and small business development, the Foundation has also received international acknowledgement for its community revitalization initiatives and, today, continues directing its focus on their Four Pillars of Community Development: Public Safety, Public Service, Public Policy, and Public Will. The Foundation remains grounded in the philosophy of its founders, Phillip Gerard and Michael Neuburger, who believed that functioning as a hybrid operating foundation was the single most effective format for serving a community with such significant needs and socio-economic disparities. In the spirit of giving back, the Foundation will launch ticket sales for the 2019 Food & Wine Experience Event on September 24th with a special 28 percent discount given to teachers and first responders for two of its most community-centric events- Sunset BBQ and Wine in the Warehouse. The discount tickets for teachers and first responders will extend through October 8, 2018 and can only be purchased at the St. Croix Foundation headquarters on the Market Square in Christiansted. As the Foundation’s annual benefit, the ‘FWE’ is now in its 12th year and has evolved into a true embodiment of the organization’s core values, grounded in holistic community development. In 2018, despite the challenges directly after the hurricanes, the Foundation and its partners and sponsors forged ahead and hosted a scaled back FWE, proving that the event series is today more than just a benefit. It represents the power of collaboration and the resiliency of our community while celebrating St. Croix’s unique spirit. 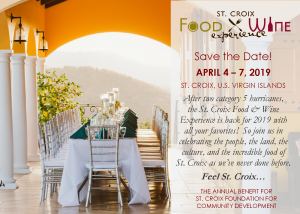 Building on this, the Foundation’s theme for the 2019 Food and Wine Experience will be ‘Feel St. Croix…’ and will celebrate the people, the land, the culture, and the incredible food of St. Croix as never before. The event will kick off on Thursday, April 4th and wrap-up on Sunday, April 7th. The weekend series will consist of five events and feature an impressive roster of guest chefs including well-known TV personalities and private chefs. Through a deepening partnership with the Department of Tourism, the event also brings to the Territory a variety of travel writers, bloggers and media representatives who expand St. Croix’s national and international exposure as a culinary and cultural destination. St. Croix Foundation for Community Development would also like to thank longstanding sponsors, partners, and vendors of the St. Croix Food and Wine Experience including Southern Glazer’s Wine & Spirits, Crucian Point, balter, Bohlke International Airways, Braata, and The Buccaneer, who have already committed to celebrating everything good about St. Croix’s culinary and cultural scene with The Foundation in 2019! The Foundation invites anyone interested in more information to visit http://www.stxfoodandwine.com or contact Deanna James at the Foundation at (340) 773-9898.